Yell House was originally built as part of a large hotel development then later housed the office team for the famous Yellow Pages for many years. The building has received a full makeover incorporating flats for the University of Reading students and an external landscaped courtyard for socialising, eating and drinking. The courtyard incorporates both hard and soft landscaped areas and raised planters housing both trees and shrubs that provide shade, screening and seasonal interest. 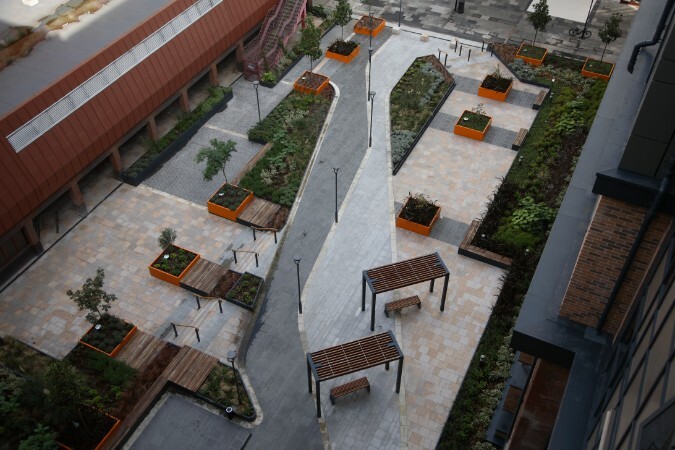 The Mona Plant System was incorporated within the planter designs at the Queens Walk development and specified by Barton Willmore Landscape Architects. With over 30 years’ heritage, the Mona Plant System has been specified on many projects across the UK and Europe. Described as a subterranean watering system, the Mona tanks are incorporated within the planting medium and deliver water direct to the plant’s roots through the process of capillary action. 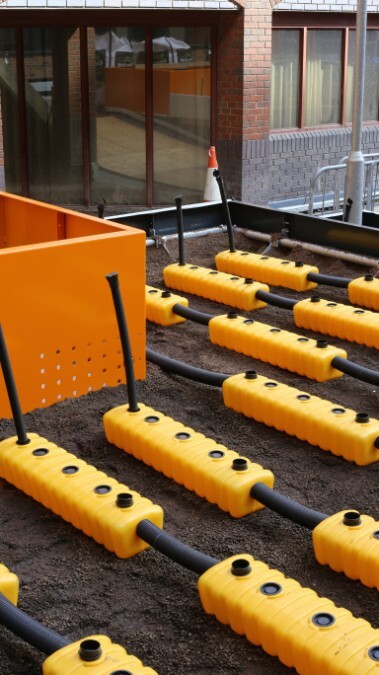 The system removes the need for surface watering, ensuring the correct amount of water is delivered as and when required by the planting. The system is 100% efficient, eliminating the risk of over or under-watering responding to the seasonal requirements of each individual plant. 150m3 of Green-tree intensive substrate was also supplied on this project, an established growing media with an excellent reputation in the marketplace. It is a blend of lightweight aggregate and award-winning Green-tree top soil; which is ideal for containerised planting or green roof projects. It is lightweight in texture and has good water holding capacity which encourages healthy plants and trees in containerised planting projects like this. Images supplied by Omos, street furniture designers and manufacturers.